This conventional style argon laser system utilizes a hard-sealed argon laser tube housed within a rigid chassis. A high flow axiel fan provides quiet and efficient cooling of the laser tube. A remote cooling option is also available. The Aries-163 Laser Head operates with the state-of-the-art LPS-1300 Power Supply to which it attaches via a highly flexible interconnect cable. 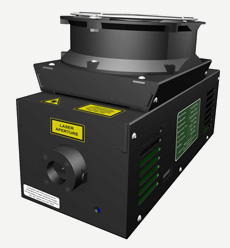 The Aries-163 Laser Head is designed to replace Spectra-Physics™ 163 Series Laser Heads. Dimensions (LxWxH – inches) 12.8" x 5.18" x 7.93"